"I created this recipe when trying to get my husband to stop eating fast food for breakfast. Crispy on the outside and full of maple walnut flavor on the inside. I make 6 at a time and freeze them -- just pop in the toaster or microwave to reheat. 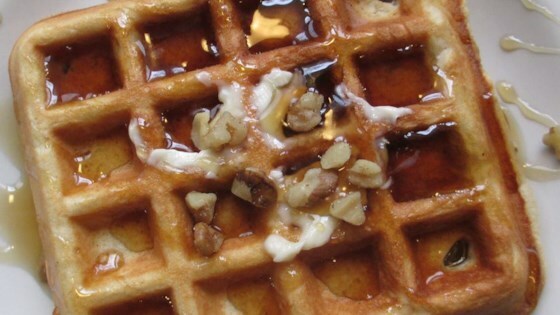 Serve with maple syrup and a sprinkling of walnuts." Preheat oven to 250 degrees F (120 degrees C). Preheat waffle iron. In a bowl, mix the pancake mix and whole wheat flour. Form a well in the center, and pour in water, oil, and syrup. Stir until evenly moist. Stir in the milk, vanilla, and cinnamon. Fold in walnuts. Pour about 1/3 cup batter per waffle into the waffle iron, and cook 5 minutes, until done. Transfer waffles to a baking dish, and place in the preheated oven. Cook 5 minutes, or until crisp. This is the best waffle we've ever eaten, except 2 Tablespoons of milk doesn't work. 2 CUPS of milk works great! excellent flavor and crispy texture. I tried it using my new waffle maker and I will make them again. I used less pancake mix and more WW flour. The flavor of this was mild. I was hoping for more maple walnut goodiness. But the kids did not care they ate them all up! Add more milk to the recipe but these are FANTASTIC. We ate them with bananas and whip cream! Will definately make again!! Thanks!! I give this four stars only because you do need to add a bit of milk. Atleast 1/2c possibly more. After that it has a wonderful flavor.